Today is the first day back to school for us. Not sure that I’m feeling quite ready for this, but here we go. These lunches are from last week’s playdate at a friend’s house. 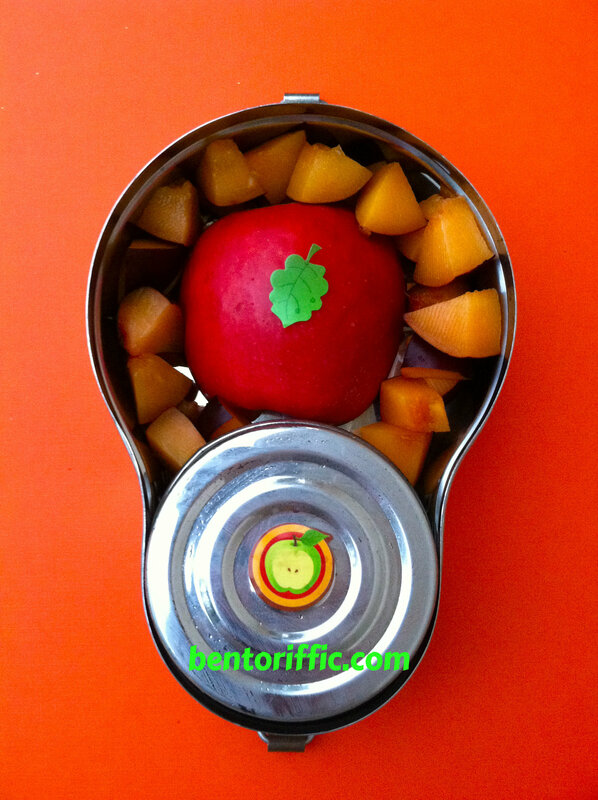 Tomorrow I will post the back to school lunches. I got 2 new sandwich makers to try. 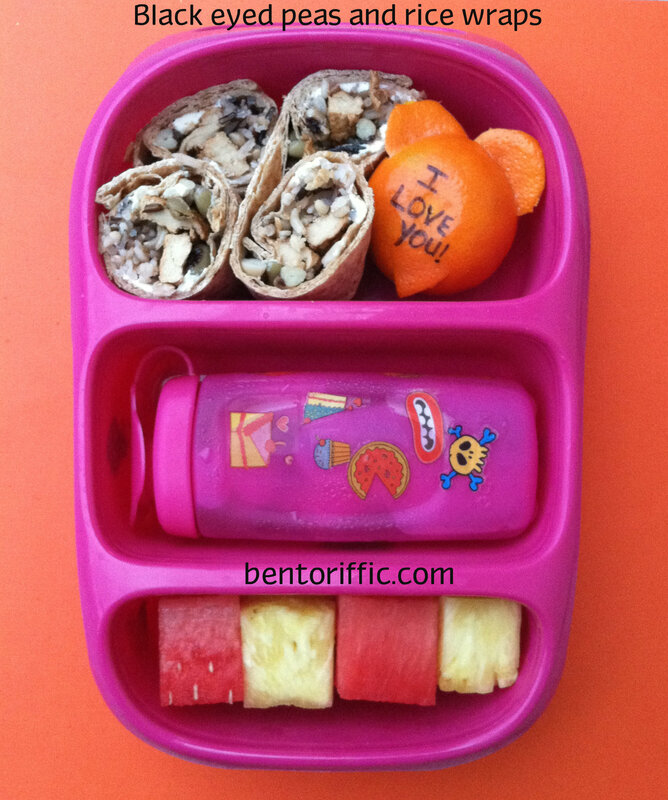 The first one is from Bento USA by All Things For Sale. I saw a lunch that they did, and I thought it was the cutest thing. Expect more pandas from us throughout the school year! 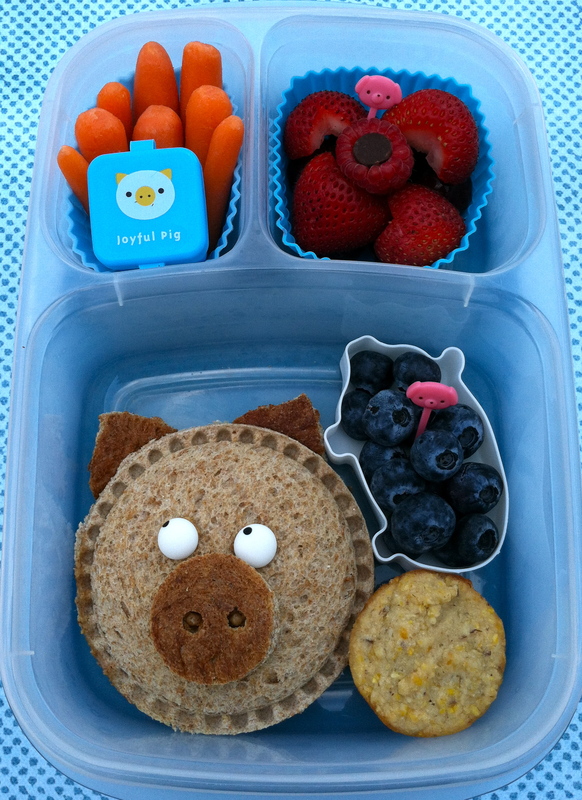 This makes sandwich pockets and even toast cute for your little picky eaters. 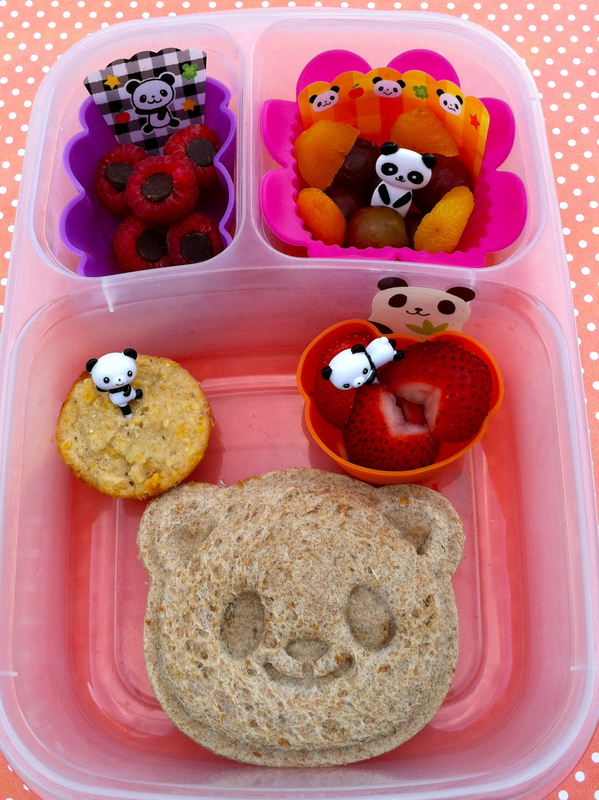 Fill the panda face with vegetables or fillings to make them different colors or simply use different kinds of bread. I was in a rush so I went for simple. The panda sandwich is on Rudi’s Whole Grain bread with Justin’s Almond Butter and strawberries in the middle. A homemade mini vegan cornbread muffin is above the sandwich and heart shaped strawberries. At the top left are organic raspberries with vegan chocolate chips in the middle and panda baran. 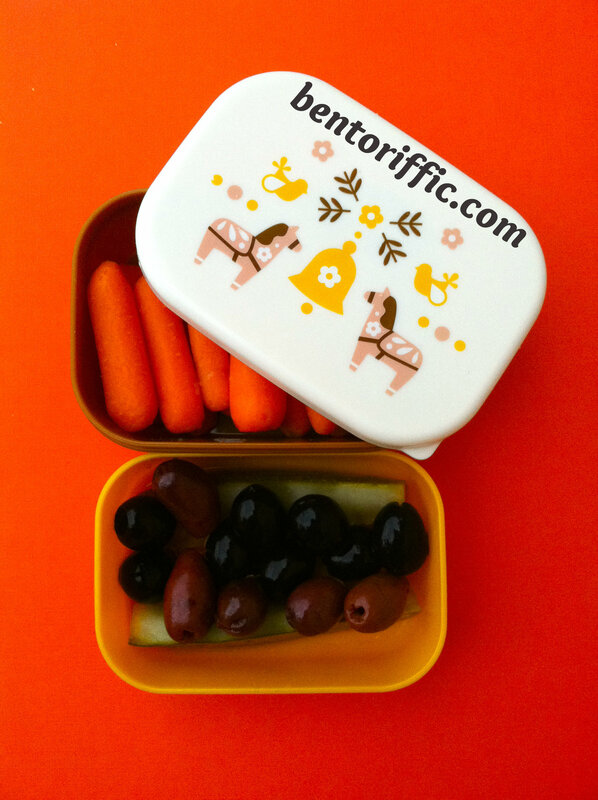 At the top right are sliced red seedless grapes and sliced dried apricots packed in an Easy LunchBoxes. And I got a new sandwich cutter from Pampered Chef friend. It’s called the cut & seal & makes uncrustable looking sandwich pockets. I get the feeling I’ll be using this one a lot as makes things quick for me, and I can easily make sandwiches ahead of time and freeze them! I decided to make a pig out of it for Little Miss 4 year old. I used candy eyes and the heel of the bread is great for dark accents (the nose and ears). She also has a vegan mini cornbread muffin and blueberries. At the top are carrots and Tufutti sour cream for dipping in the small pig container. 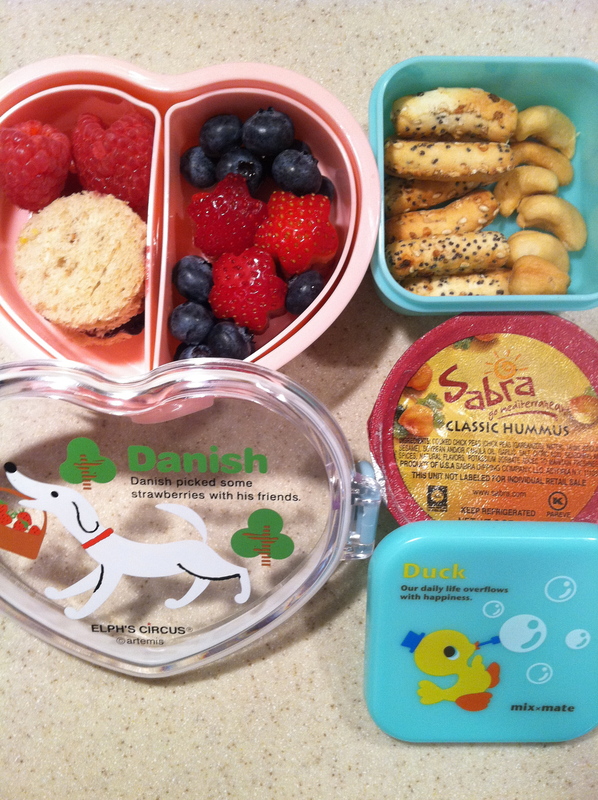 At the top right are strawberry hearts with a raspberry in the middle and pig pick packed in her Easy LunchBox. I packed myself a plain almond butter sandwich and a LunchBots Duo full of fruit. 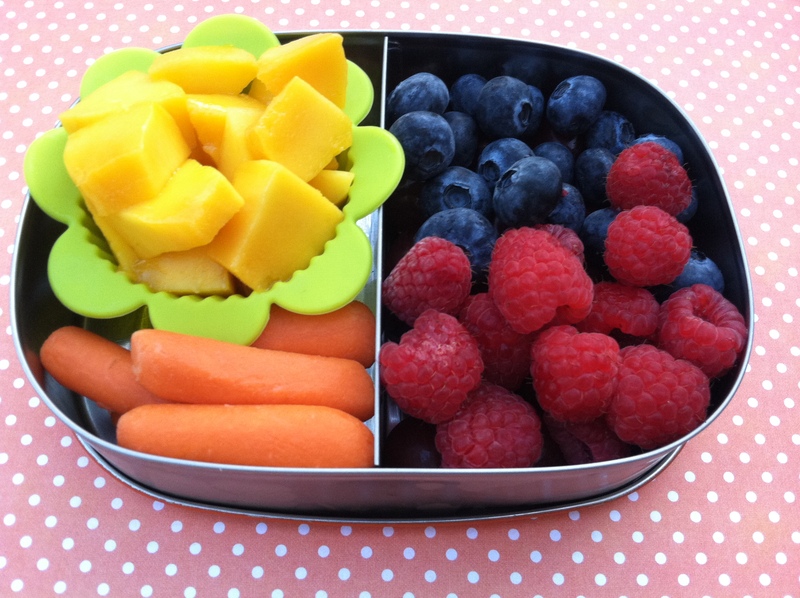 From the top left are fresh, local Florida mango chunks, blueberries, rasperries and mini carrots. This was from last week’s lunches. I’m just behind on posting. I was running late the morning I made this. I used a dinosaur cookie cutter. I used a chocolate decorator drop for the eye and the leftover crust for the plates and the spiked tail on the Stegosaurus. 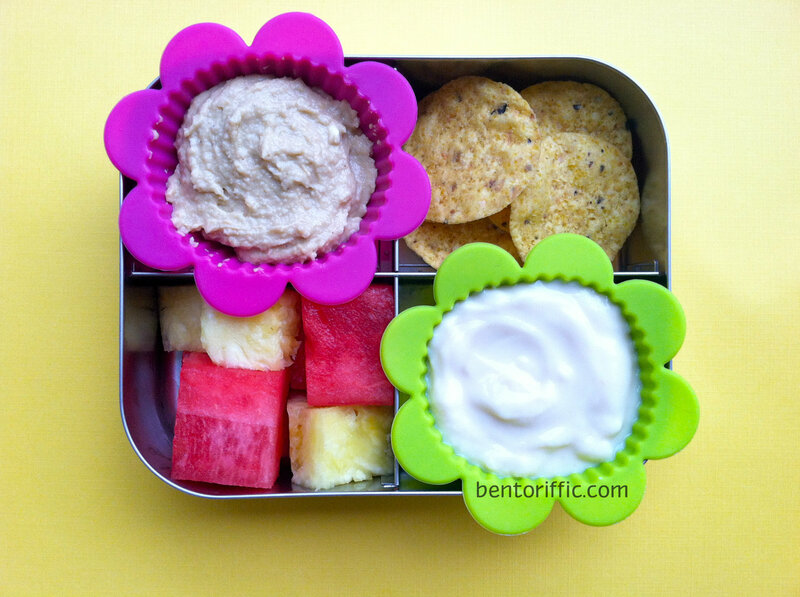 I added some wheat spiral umbrella cookies I found at the Asian grocery store along with the snack size Sabra hummus, whole grain pretzel sticks and Craisins in the stainless LunchBot bento. In the butterfly container, I cut strawberries with my stainless flower vegetable & fruit cutter and filled in the space with raspberries & blueberries. Little sis got a smaller version of the lunch. 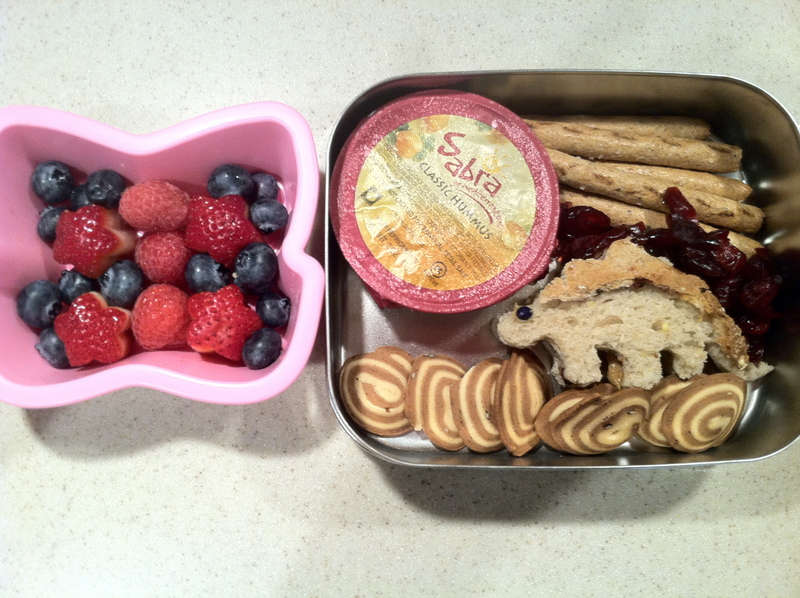 She also had the hummus with mini bread sticks for dipping, cashews and in the heart bento she got raspberries, blueberries, flower shaped strawberries and a mini PB&J circle sandwich. Both girls had a Lifeway Kefir pouch and waters with their lunches.